Thank You for an Incredible 6th Annual Ultimate Tailgate Party! We are thrilled to report that the 2016 Ultimate Tailgate Party was our most successful fundraiser yet. Your support helped us raise more than $250,000! It was a spectacular end to a record breaking week, which marked the rescue and distribution of our 5,000,000th pound of food. Bravo to EVERYONE! On Sunday evening we welcomed more than 500 supporters to the Black Falcon Terminal at Boston’s Cruiseport for our 6th annual event. We also welcomed our sponsors, Dorothy Puhy, BMO Capital Markets, Credit Suisse, KPMG, PwC, Blue Cross Blue Shield, Peterson Party Center, MS Walker, Peak Organic, Boston Common Magazine, Jamestown, Cafco, and Winston Flowers! We also had a record number of volunteers this year, all of whom were amazing and spirited – we thank you all. Our incredible Co-Chairs for the second year in a row, Andy & Mariann Youniss of Wellesley, led a tremendous and spirited Host Committee. Andy is the CEO of Rocket Software, and sits on our Board of Directors – and Mariann has continued to get more involved with our work. Andy welcomed everyone and remains our best example of what it means to ‘make it personal’ – and get involved. Our COO (and one of Boston Business Journal’s 2016 40 Under 40 honorees) Lauren Palumbo, proudly and passionately spoke about the year’s operational milestones, and inspired the crowd to get to know who we are, and why our model works. We were lucky enough to have Filmmaker Jon Mercer produce this incredible tribute piece to Jamie, with cameos from Will Gilson, Louis DiBiccari, Joanne Chang, Christopher Myers, Ken Oringer, and Andrew Zimmern. 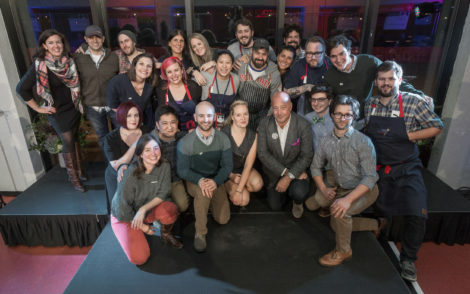 As attendees enjoyed food from incredible chefs and restaurants from Providence up to Portland, TJ Connelly spun the party soundtrack of the year, and the team at Offsite served up cocktails featuring Maker’s 46, Basil Hayden, and Knob Creek Rye. Our silent auction scrolled on screens throughout the space as folks tried to outbid each other on trips to Cabo San Lucas, Bermuda, Nantucket and Los Angeles, rare wine lots and unique dining experiences. After another short video about our work, Ming Tsai introduced Andrew Zimmern to the crowd – and our favorite emcee brought the house down with an emotional plea for food justice, and for support on our behalf. We raised more than $50k in just a few minutes, and ended by auctioning off signed Gronk and Brady jerseys, and a football signed by Tom Brady! Each truck we put on the road rescues 400,000 lbs of fresh, healthy food each year – and we keep them on the road with your support. Follow along on Instagram, Twitter, and Facebook as we post photos from the party in the coming days.